Expectations for things about zombies are a bit higher these days. It’s no longer enough to just be “grr… brains”, screaming, shotguns and bloody messes, now to sustain a show you need to investigate bigger questions like what it means to be human and what it’s worth giving up to survive. 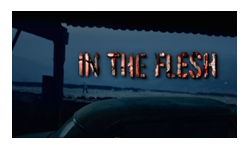 The concept behind In the Flesh is a fascinating one, clearly building on those questions. It is set after the apocalypse, the ‘risen’ have been defeated and once properly medicated they are being reintegrated into a society that up until recently was liberally applying shotgun pellets. Families are equal parts thrilled and hesitant about getting their previously buried loved ones back. The ‘partially dead syndrome’ sufferers meanwhile are equally conflicted with horror at what they did in their zombie states and joy at the chance of a second life. So far, so good. Unfortunately though, that’s as good as it gets. There are two massive problems with the show. Well, really it’s only one problem, which is the writer, but his ineptitude manifests in two distinct and unforgiveable ways. First off the tone is all over the place. Half of the series is played almost as a spoof. The government handling is laughably awful, with hideously cheesy propaganda and bumbling officials and completely unable to stand up against the local militia. The fact that I have no interest in watching a show with that kind of humour is bad enough, but it completely undermines the other half of the show which is trying to talk about exceptionally dark and complicated issues. The second, and bigger problem though is that this show isn’t about zombies. Oh no, you see it’s about outsiders, a community who can’t understand or even conceive of the fact that some people are different, but they’re still people. But the audience might not have spotted that by themselves, so instead you must be bludgeoned over the head with it through having a separate ‘PDS sufferers’ section of the bar, a hookup between a sufferer and a ‘normal’ person which ends in self hatred and violence. Oh, and as if that weren’t clear enough, two of the characters actually ARE gay and completely avoid talking about it even between the two of them, let alone alluding to it with their families. In the Flesh is Dominic Mitchell’s first writing credit and it really, really shows, beyond the one paragraph concept I’m not sure there’s a single thing that he managed to get right. The terrible dialogue, inconsistent characters, a too weak lead and gaping plotholes just compound the problems with tone and story. It feels like the kind of thing a student would turn in to illustrate that they’d grasped the key concepts of a lecture on symbolism without having to worry about applying any lessons on subtlety, elegance and actual competent writing. It is so incredibly unsubtle that it is actually offensive. I honestly feel bad because I didn’t switch it off and BBC Three should be ashamed for commissioning it. In the Flesh is available on iPlayer until 7th April. Please don’t watch it! In particular, I think that the support group meeting was good enough to justify the rest of the series on its own. Regarding the hookup, are you getting two different characters confused (the militia guy who attacked Amy and the council guy who slept with her) or did you mean that the council guy was responsible for the new rule? I got the impression that the vicar was really calling the shots there. I don’t think one good scene makes up for the other 177 minutes of rubbish I’m afraid. If that’s what the writer can do well (and I agree, characters like Kieren’s mother were very elegantly written) then he should just write that show and skip the symbolism. You’re right, I was merging two characters together. So their encounter just led to verbal threats and self loathing. Ah well.